Interstate 235 provides the most direct route through Downtown Oklahoma City, with connections to many of the major east-west city streets along its route. The southern three miles follow the Centennial Expressway, while the rest of the route follows the Broadway Extension. Photo taken 10/20/03. Following a combination of the Centennial Expressway and Broadway Extension, Interstate 235 through Oklahoma City links Interstates 35 and 40 by Bricktown with Interstate 44 near Nichols Hills. U.S. 77 overlaps with all of the Interstate route, extending north from I-35 to the Broadway Extension freeway to Edmond. Rebuilding of the oldest section of Interstate 235, from North 36th Street to Interstate 44, got underway by 2011. Completed at that time was a new ramp from I-44 east to I-235 south. The $10 million project replaced the first of the substandard ramps at the cloverleaf interchange joining the two freeways. The Off Broadway project commenced on August 22, 2016 with work from North 36th to NW 63rd Streets. The resurfacing contract was completed ahead of schedule by late September 2016. Succeeding construction was underway in January 2017. The $88 million third phase expands Interstate 235 to six overall lanes and replaces the BNSF Railroad and North 50th Street overpasses. This phase runs through early 2020. Estimated to cost $31 million, additional work will add flyovers linking Interstate 235 north with I-44 west and from I-44 east to U.S. 77 (Broadway Extension) north. Subsequent reconstruction of the ramp joining Interstate 44 westbound with Broadway Extension north is estimated to cost $24 million. Completion of the overall Off Broadway project is not expected until 2024. Button copy guide sign for Broadway Extension along Interstate 44 east. Vidcap taken 05/25/95. Prior to the completion of I-235 through Oklahoma City, U.S. 77 overlapped with I-44 east from Broadway Extension to Lincoln Boulevard south. An imprint for U.S. 77 appeared on button copy guide signs at the north end of I-235 for a period of time. Vidcap taken by Cary B. Todd (03/94). U.S. 77 originally navigated through central Oklahoma City along surface streets. Overlapping with U.S. 62, U.S. 77 partitioned along the couplet of Robinson Avenue / Broadway through Downtown to NE 23rd Street east (U.S. 270). 23rd Street took U.S. 62-72-270 east to the State Capitol and Lincoln Boulevard. There U.S. 77 combined with U.S. 66 Business north to Grand Boulevard, the predecessor to Interstate 44 and the Northeast Expressway. Construction was underway by 1962 for Broadway Extension south from U.S. 66 (Grand Boulevard) topping Park. Upon completion, the freeway spur south from U.S. 66 was unnumbered. What would eventually become a part of I-235 south to I-35 and I-40 was originally referenced as the Capital Freeway. 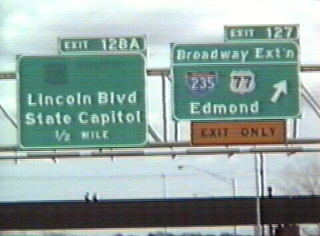 The Capital Freeway was proposed to tie into Lincoln Boulevard south of the Capitol on the 1976 Official Oklahoma Highway Map. U.S. 77 was initially realigned from using Robinson Avenue southbound to follow just Broadway through Downtown. The relocation from 5th Street SW north to 23rd Street NW was approved by AASHTO on October 28, 1978. The 1981 Official Oklahoma Highway Map shows U.S. 77 changed again, following Reno Avenue east to Lincoln Boulevard north. Upon completion of the Centennial Freeway, U.S. 77 shifted a final time to overlap with all of Interstate 235. The initial sign for the north end of Interstate 235 appears at the parclo interchange (Exit 3) with North 36th Street. Photo taken by Eric Stuve (08/29/15). The oldest section of Interstate 235 leads north into a full cloverleaf interchange with Interstate 44. The Off Broadway construction project through 2024 expands this section of freeway to six lanes and upgrades the forthcoming exchange to include flyovers and higher speed ramps. Photo taken by Eric Stuve (08/29/15). A grassy area remains from the bridge abutment for the removed off-ramp from I-235 south to Santa Fe Avenue at the quarter mile guide sign for Interstate 44 east. The northbound exit for Santa Fe Avenue and North 50th Street closed during the Off Broadway project. Photo taken by Eric Stuve (08/29/15). Crossing Deep Fork creek, Broadway Extension north enters the unnumbered cloverleaf interchange with Interstate 44. The east-west freeway (Northeast Expressway) travels wholly within Oklahoma City between Interstates 40 and 35, so no control points are used. Photo taken by Eric Stuve (08/29/15). Interstate 235 ends as traffic departs for Interstate 44 west toward SH 74 (Lake Hefner Parkway) and NW 39th Street (Historic U.S. 66-270) to the suburb of Bethany. Broadway Extension continues northward as a freeway into the city of Edmond. Photo taken by Eric Stuve (08/29/15). A lane drop occurred at forthcoming Exit 3 for North 36th Street on the 1.75 mile approach to Interstate 44 on I-235 & U.S. 77 (Broadway Extension) north. Construction through 2020 expanded the northbound freeway to three through lanes. Photo taken 10/20/03. A folded diamond interchange joined Interstate 235 & U.S. 77 with North 36th Street, as the freeway made an S-curve through the exchange. Subsequent construction straightened out the freeway and reconfigured Exit 3 into a parclo interchange. Photo taken 10/20/03. Broadway Extension shifts northeast to pass under North 50th Street to what was a partial trumpet interchange with an access road linking I-235 with parallel Santa Fe Avenue north of NE 50th Street. The overpass and southbound off-ramp to Santa Fe Avenue were demolished by 2013 to make way for a new off-ramp from I-44 east to I-235 south. Photo taken 10/20/03. An early phase of the Off Broadway project for I-44/235 added a new flyover for Interstate 44 west from U.S. 77 (Broadway Extension) south. The new overpass spans the on-ramp from NW 63rd Street, eliminating a weaving traffic pattern. Sign changes included the addition of control cities for I-44. Photo taken by Eric Stuve (04/14/13). Broadway Extension spans Interstate 44 across bridges built in 1962. Work through 2020 replaces these overpasses. Additional a collector distributor roadway will separate movements from the west side ramps with I-44 from the I-235 & U.S. 77 southbound mainline here. Photo taken 05/06/12. Construction through 2012 elevated the westbound on-ramp to I-44 from U.S. 77 (Broadway Extension) south to pass over the oncoming ramp from NW 63rd Street. The new ramp departs from the freeway 0.6 miles further north, ahead of the NW 63rd Street overpass. Photo taken 05/06/12. U.S. 77 (Broadway Extension) south at the previous ramp departure for Interstate 44 (Historic U.S. 66) west. Prior construction through October 31, 2002 widened Broadway Extension south toward I-44/235. Photo taken 05/06/12. The first sign referencing Interstate 235 south along Broadway Extension was this overhead posted at the off-ramp for Santa Fe Avenue and North 50th Street. This exit permanently closed to accommodate a new high speed ramp from I-44 east to I-235 south opened in 2013. Photo taken by Jeff Morrison (12/28/05). Interstate 44 overtakes the Northwest Expressway (Historic U.S. 66) at Western Avenue, one half mile ahead of the full cloverleaf interchange (Exits 127A/B) with Interstate 235 south and U.S. 77 (Broadway Extension). Photo taken by Eric Stuve (07/10/14). The on-ramp from Western Avenue adds an auxiliary lane to I-44 east to Exit 127A for Interstate 235 & U.S. 77 (Broadway Extension) south. Photo taken by Eric Stuve (07/10/14). A new wider ramp with a higher design speed opened to traffic from I-44 east to Broadway Extension south on January 18, 2014. Completed three months ahead of schedule, the $9 million construction project was an early phase of the Off Broadway project underway from 2016 through 2024.2 Photo taken by Eric Stuve (02/23/13). A future flyover ramp will depart from the current Exit 127A ramp to U.S. 77 (Broadway Extension) north to Edmond. Photo taken by Eric Stuve (02/23/13). Ramps within the 1957-designed cloverleaf interchange2 at Broadway Extension departed one mile east of the I-44 merge with Northwest Expressway (Historic U.S. 66). The 2014-opened ramp departs a half mile further west. Photo taken 05/06/12. 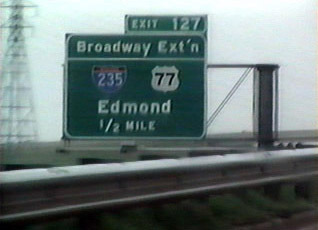 A ground level sign preceded the substandard ramps for I-235 & U.S. 77 south toward Downtown Oklahoma City and U.S. 77 (Broadway Extension) north to Edmond. Photo taken 05/06/12. A collector distributor lane separated from the Interstate 44 eastbound mainline for Interstate 235 & U.S. 77 (Broadway Extension). Photo taken 05/06/12. The old southbound ramp for Interstate 235 & U.S. 77. This area of pavement was demolished to accommodate the eventual wider loop ramp from Broadway Extension south to Interstate 44 east. Photo taken 05/06/12. A semi directional T interchange (Exit 128A) connects Interstate 44 with the north end of Lincoln Boulevard (old U.S. 66 Business & 77), a half mile ahead of Interstate 235. U.S. 77 previously overlapped with I-44 west to make the connection with Broadway Extension north. Photo taken by Jeff Morrison (12/28/05). A c/d lane presently facilitates movements to U.S. 77 (Broadway Extension) north to Edmond and I-235 & U.S. 77 south to the Oklahoma State Capitol. The Off Broadway project will build a flyover carrying traffic from I-235 north to I-44 west, eliminating the current loop ramp and weaving traffic pattern here. Photo taken by Eric Stuve (10/24/15). Broadway Extension continues 6.3 miles north as a commuter freeway into the city of Edmond. U.S. 77 follows Broadway north along a commercial arterial to 2nd Street and the University of Central Oklahoma. Photo taken 10/20/03. Interstate 235 & U.S. 77 travel four miles south to the Oklahoma City Business District and 5.3 miles to combine with I-35 south. Photo taken by Jeff Morrison (12/28/05). Interstate 235 & U.S. 77 (Centennial Expressway) angle southeast from the North 10th Street off-ramp (Exit 1G), 1.5 miles to meet Interstates 35 and 40. Guide signs for the succeeding exit incorrectly displayed Walnut Avenue as Walnut Street. Photo taken by Eric Stuve (02/23/13). Exit 1F quickly follows Exit 1G for Walnut Avenue south at NE 6th Street and Harrison Avenue. Sign changes made here by 2017 corrected the Walnut Street error and added an overhead for Oklahoma City Boulevard (Exit 1C) west. Photo taken by Eric Stuve (08/05/17). Continuing southeast, I-235 & U.S. 77 advances one mile to the systems interchange (Exits 1B/A) with I-35, I-40, U.S. 62 and U.S. 270. Photo taken by Eric Stuve (08/05/17). Four lanes of traffic on I-235 south elevate across Lincoln Boulevard (old U.S. 62-77) and a railroad line southeast ahead of back to back ramps for Oklahoma City Boulevard (Exit 1C) and Interstate 40 & U.S. 270 west to Amarillo (Exit 1B). Photo taken by Eric Stuve (08/05/17). Interstate 40 was realigned southward from the aging Crosstown Expressway viaduct over a multiyear project completed in 2012. Oklahoma City Boulevard follows the original freeway right of way as a surface boulevard, while I-40 loops southward closer to the parallel North Canadian River. Photo taken by Eric Stuve (08/05/17). A left-hand ramp (Exit 1A) takes motorists from the Centennial Expressway south to I-40 & U.S. 270 east to Tinker Air Force Base and Shawnee and I-35 leading back north. The I-235 & U.S. 77 mainline otherwise default onto Interstate 35 south to Moore and Norman. Photo taken by Eric Stuve (08/05/17). Former guide signs at what was the last mainline off-ramp (Exit 1F) from Interstate 235 south. Exit 1C departs further south for Oklahoma City Boulevard west to Bricktown now. Photo taken by Eric Stuve (09/04/02). Exit 1B for Interstate 40 west previously connected with the Crosstown Expressway wrapping around the south side of Oklahoma City. The 1966-viaduct was demolished following completion of the eight-year project to realign I-40. Photo taken by Jeff Morrison (12/28/05). Interstate 35 shifts northwesterly from the SE 20th Street overpass toward the North Canadian River and the directional interchange (Exit 126) with Interstate 40 and the Centennial Expressway (I-235). Photo taken by Eric Stuve (07/26/16). Advancing north with four lanes, ramps for Interstate 40 west to Amarillo and the continuation of I-35 north onto I-40 & U.S. 270 east depart nearly simultaneously from the end of the North Canadian River span. Photo taken by Eric Stuve (07/26/16). Interstate 35 makes a TOTSO movement along side U.S. 62 to combine with I-40 and unsigned U.S. 270 east for less than a mile. U.S. 77 continues north along I-235, though signs here omit the route. Photo taken by Eric Stuve (12/24/16). Interstate 235 begins as a left-hand ramp (Exit 126) departs for I-40 west to Yukon, El Reno and Amarillo, Texas. Photo taken by Eric Stuve (12/24/16). These advance signs for Interstates 40 and 235 at the SE 15th Street overpass were installed during the mid-1990s during early work to reconstruct and expand Interstate 35 in south Oklahoma City. Photo taken 10/20/03. Button copy signs posted ahead of the North Canadian River and directional T interchange with Interstate 40. Photo taken 10/20/03. These signs for Interstates 35 north, I-40 and U.S. 62 east were carbon copied to use Clearview font. U.S. 77 and U.S. 270 are still ignored at the exchange. Photo taken 10/20/03. A new ramp (Exit 125C) for Oklahoma City Boulevard departs from just ahead of Exit 126 for I-40 west now. Oklahoma City Boulevard was built in the footprint of the old Crosstown Expressway west into Bricktown. Amarillo lies 256 miles to the west. Photo taken 10/20/03. Interstate 35 & U.S. 62 dog legs west along side Interstate 40 & U.S. 270 for 0.8 miles from a directional T interchange to Interstate 235 & U.S. 77 (Exit 126). Photo taken by Eric Stuve (04/12/13). Traveling west between Reno Avenue and the North Canadian River, simultaneous off-ramps depart for both I-235 & U.S. 77 north to the Oklahoma State Capitol and eastern reaches of Downtown and for the continuation of I-35 south to Ardmore, Denton and Dallas-Fort Worth in Texas. Photo taken by Eric Stuve (07/26/16). The Interstate 35 southbound mainline reduces to a one lane TOTSO ramp from the left as three lanes continue west along I-40 & U.S. 270 around the south side of Downtown Oklahoma City. I-235 (Centennial Expressway) angles northeast along side the Bricktown and Midtown areas. Photo taken by Eric Stuve (07/26/16). Older guide signs for the Interstates 35 south and 40 separation used the left lane and right lane verbiage. Control points otherwise remain the same with Clearview font sign replacements. Photo taken by Eric Stuve (11/08/02). U.S. 62 navigates throughout the Oklahoma City metro area along side Interstates highways. Entering I-35 from NE 23rd Street to the east, the US highway follows the freeway south to I-240, and the Southwest Expressway west to I-44 and Newcastle. Photo taken by Eric Stuve (09/11/02). The new eastbound lanes of Interstate 40 to the south of Downtown Oklahoma City opened to traffic on January 5, 2012. These replaced a narrow viaduct (Crosstown Bridge) located further north. The freeway passes by Wheeler Park ahead of Exit 150A for Shields Boulevard (old U.S. 77), 2.25 miles west of I-235 north. Photo taken by Eric Stuve (05/11/13). Guide signs posted along the 2012-completed section of I-40 reference the U.S. 77 overlaps with I-35 south to Norman (Exit 113) and I-235 north to Broadway Extension. Photo taken by Eric Stuve (08/29/15). The southbound lanes of I-235 & U.S. 77 pass overhead as Exit 151B departs for I-35-U.S. 77 south and U.S. 62 west. I-35 joins Downtown Oklahoma City with Moore, Norman and Ardmore on the 202-mile drive to Dallas, Texas. Photo taken by Eric Stuve (05/11/13). A loop ramp (Exit 151C) follows for Interstate 235 & U.S. 77 north. The Centennial Expressway passes between the Downtown Business District and Lincoln Boulevard (old U.S. 62-77) leading north to OU Medical Center, and the State Capitol. Photo taken by Eric Stuve (08/29/15). Traveling east along the former Crosstown Bridge, 1.25 miles ahead of Interstates 35 and 235. I-40 was realigned from the deteriorating six-lane viaduct during an eight year project started in 2005. The freeway shifted southward along an at-grade alignment with up to ten lanes of capacity. Photo taken 10/20/03. One half mile ahead of Exits 151B/C for Interstate 35 & U.S. 62-77 south to Moore and I-235 & U.S. 77 north to the State Capitol and Edmond on the Crosstown Expressway east. Photo taken 10/20/03. A loop ramp (Exit 151A) departed from I-40 & U.S. 270 east to Lincoln Boulevard north just ahead of Interstate 235. Lincoln Boulevard was realigned to accommodate the new I-40 alignment. Photo taken 10/20/03. Interstate 40 originally traveled due east from Walker Avenue east into the directional T interchanges with I-35 south and I-235 north. The freeway approaches from the North Canadian River to the southwest now. Photo taken 10/20/03. Exit 151C loops onto I-235 and unsigned U.S. 77 north toward Downtown Oklahoma City. The succeeding two off-ramps of I-40 east use Interstate 35 based exit numbers. Photo taken 10/20/03. Celebrate the Interstate: America’s Interstate Highway System Turns 50! http://www.okladot.state.ok.us/okinterstate50/ Oklahoma Department of Transportation web page. “New ramp at I-235 and I-44 to open in Oklahoma City.” The Oklahoman (Oklahoma City), January 18, 2014. Page updated August 23, 2017.